This altarpiece, made of tin-glazed terracotta, depicts the Assumption of the Virgin, a popular theme especially in 15th and 16th century Tuscany. 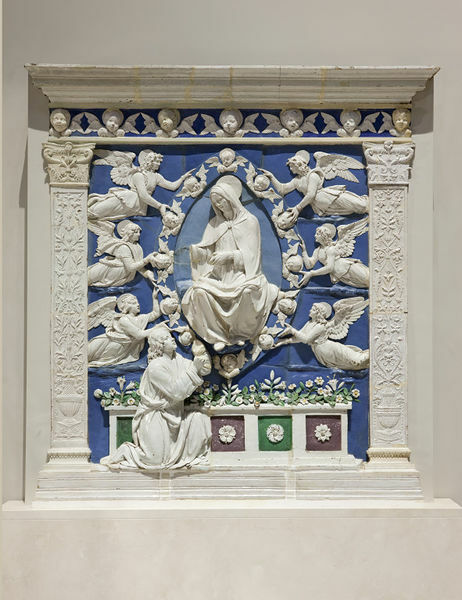 It is attributed to Andrea della Robbia's workshop. The design is a modified version of a more complex altarpiece created by Andrea della Robbia for a church in La Verna. This work may have been commissioned by the Canigiani family as it is believed to have originally come from the Canigiani family villa in Tuscany. Trained as a marble sculptor in the studio of his uncle Luca, Andrea della Robbia also became an excellent modeller, unrivalled in his ability to capture the life of his subjects in glazed clay. His best-known works are 10 roundels of infants on the façade of Florence's Foundling Hospital (about 1487). This tin-glazed terracotta altarpiece depicts the Assumption of the Virgin, when St Thomas was said to have received the girdle from the Virgin Mary. The altarpiece was purchased in 1860 along with a lunette depicting God the Father and two cherubim. The lunette did not form part of the original altarpiece, as is evident from the dimensions and scale of the figures which are too large when compared with the figures in the altarpiece. 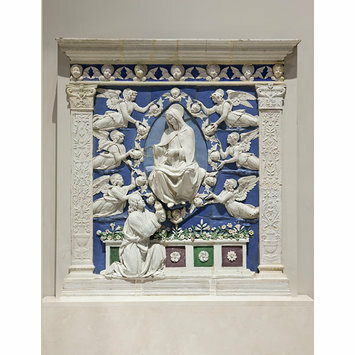 However, other della Robbia altarpieces include lunettes and these must have inspired the pairing. The right hand of the Virgin and the left hand of St Thomas are missing and were made up in plaster, as well as parts of the frieze. Historical significance: The relief depicts the Assumption of the Virgin. She is shown giving the girdle (a piece of cloth used as a belt) to St Thomas. This event is not found in the Bible, but is part of the Apocrypha (or extra texts of unknown authorship) associated with Mary and her life. The town of Prato in Tuscany claimed to own the relic of the girdle and it was (and still is) displayed five times a year from the pulpit created by Donatello on the exterior of the cathedral. The subject was particularly popular among Franciscans. Though the validity of the Assumption was the topic of some debate during the early Middle Ages, by the mid 1100s and early 1200s some Italian preachers, including Franciscans such as St Anthony and St Bonaventure addressed it in their sermons for the Feast of the Assumption. In the 14th and 15th centuries, the Franciscans used the argument for the truth of the Assumption of the Virgin to support the doctrine of the Immaculate Conception, which the Dominicans opposed. However, it would seem most Franciscan sermons discussed the Assumption in terms of subsequent coronation of Mary as Queen of Heaven, not specifically the moment in which she handed her girdle to Thomas. The scene of the Assumption and the dropping of the girdle were also popular in Florence in non-Franciscan contexts. Sculpted images of the Virgin handing her girdle to Thomas were found on Andrea Orcagna’s Tabernacle of Orsanmichele from 1352, in the stained glass lunette at Orsanmichele from 1430, Nanni di Banco’s 1414-21 relief above the Porta della Mandorla (north door) of the Duomo. Robinson noted that the relief was purchased in Florence but its original location was from a “church or chapel of the family Canigiani, near Poggio Imperiale…” outside Florence (Pope-Hennessy , citing Robinson, p.66). Pope-Hennessy deduced that the relief probably came from the chapel of the Palazzo dei Canigiani in Pian di San Felice a Ema, which is near Poggio Imperiale. (Pope-Hennessy). Simone di Canigiani (1402-1465) owned land and a home in the Val d’Ema and other nearby towns. It is not clear if this was the palazzo referred to above, or another home. (DBI, vol.18, p.96) His son Antonio was a known follower of the Ferrarese preacher Savonarola along with members of the della Robbia family, but without further evidence a correlation cannot be established. This altarpiece demonstrates the continuity of motifs and models in Andrea della Robbia’s workshop. The original design was created by Andrea in 1486 for the church of Santa Maria degli Angeli at La Verna near Assisi, which Domenico Bartoli and his brothers restored. The altarpiece shows the arms of Domenico Bartoli and his wife Maddalena di Rucellai on the predella. In the original version, the Madonna hands her girdle to St. Thomas, who is flanked by Sts Gregory, Francis and Bonaventure. Four angels support the cherubim covered mandorla in which the Virgin is seated. More cherubim decorate the frieze below the lunette. There are several altarpieces attributed to the workshop with the Assumption of the Virgin that have been modified by the addition of different saints. The saints probably represent either the patron saint of the commissioner or the titular saint of the church in which the altarpiece was originally housed. The member of Andrea's workshop who created the V&A version modified the master's original design. Only Thomas kneels before the Virgin, and the mandorla is supported by six angels. The mandorla and the cornice include cherubim, but the lunette is missing. Because the flanking saints have been eliminated from the design, the tomb of the Virgin, filled with flowers upon the removal of her body, has been extended on either side of Thomas. It is the simplest of the existing versions of similarly-themed altarpieces, as altarpieces at churches in Foiano and S.Fiora in Italy, and the Frankfurt Neue Stadtische Gallerie all include at least one saint in addition to Thomas, as well as more elaborate predellas and frames. The della Robbia family was led by Luca (ca. 1400 –1482), who is credited with the invention of applying tin glazes to terracotta sculpture in Florence. (though the technique dates back to antiquity). Luca originally trained as a goldsmith and sculptor, producing works in marble and bronze in his early career. In the mid -fifteenth century he turned his attention to the development of tin-glazed terracotta, focusing the workshop and its production. The medium became very popular because of its beauty and durability as well as its low cost relative to marble or bronze. The recipe for the tin-glaze was a closely guarded secret in Florence held only by the della Robbia family and the members of their workshop. The historian and artist Giorgio Vasari noted that the city fathers promoted it as a particularly Florentine art and encouraged its export to Europe. Luca’s nephew Andrea (1435 -1525) and his son Giovanni (1439 – ca.1530), along with their sons and nephews joined the workshop and continued production into the mid sixteenth century. Andrea’s workshop produced an enormous amount of terracotta artworks, including family shields, altarpieces and other religious works. He is perhaps best known for the roundels of swaddled children on the loggia designed by Brunelleschi at the Ospedale degli Innocenti in Florence. Terracotta altarpieces such as this one had the same function as painted altarpieces, but could also function as outdoor street tabernacles due to the durability of glazed terracotta. Robinson, J. C., Italian sculpture of the Middle Ages and the period of the revival of art: a descriptive catalogue of the works forming the above section of the South Kensington Museum, London, 1862. Cavallucci, C. J. and Molinier, E. Les della Robbia, leur vie et leur oeuvre, d'apres des documents inedits, suivi d'un catalogue de l'oeuvre des Della Robbia in Italie et dans les principaux musees de l'EuropeParis, 1884, p. 267, As School of Andrea della Robbia. Cruttwell, M. Luca and Andrea della Robbia and their successors, London, 1902. Marquand, A. Andrea della Robbia and his Atelier, ii, Princeton, 1922, p.205, no.357 as Workshop of Andrea della Robbia. Pope-Hennessy, J. assisted by Lightbown, R. , Catalogue of Italian Sculpture in the Victoria and Albert Museum, London, 1964, cat.207. As workshop of Andrea della Robbia. G. Gentilini, ed., I della Robbia e l'arte nuova della scultura, exh. cat. Fiesole, Basilica di Sant'Alessandro, 1998, pp.118-119, illus. 119 as Andrea della Robbia. Gentilini, G., "Sulle primi altare terracotte," Arte Christiana, vol.80, 1992, pp. 439-450. A number of similar altarpieces from Andrea's workshop survive which all depend from an autograph altarpiece by Andrea della Robbia in Santa Maria degli Angeli at La Verna of about 1486. According to early Christian apocryphal literature, the Virgin's soul and body were taken to heaven three days after her death. The Virgin is shown dropping her girdle to St Thomas as proof of her ascension.